Both Julie and I want to personally thank you for the time and dedication you gave us on our special day. We’ve now had a good chance to look at the photos and video you made. Both are absolutely amazing (brought tears to our eyes.) You taking the photos makes our memories come alive. Thank you, again so much for the wonderful memories you’ve given Julie and myself. Hi, my name is Gaz. Ever grateful for living on the beautiful Byron coastline and being married to my loving wife Jacqui. We are both obsessed with making every wedding awesome You see, Jacqui is a fun Celebrant and I tell wedding stories (in pictures). Byron Bay is a top wedding destination but we happily travel interstate and overseas for special occasions. 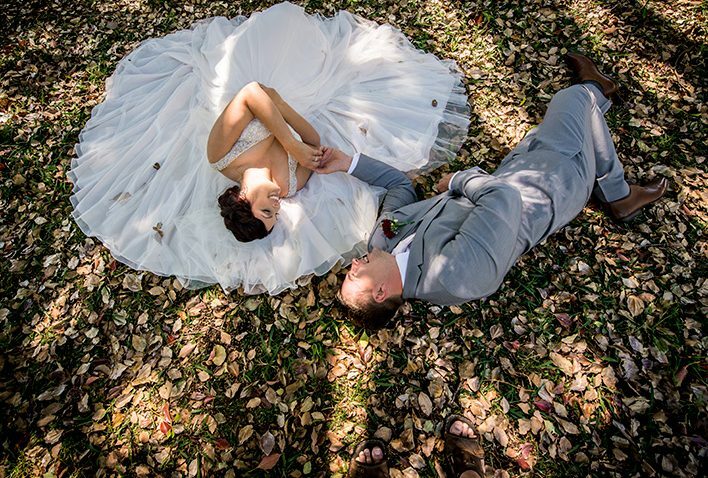 I am the funnest Byron Bay photographer that you call when your wedding pictures mean the world to you. Yes, it has to be a fun experience and the vibe shows in the results. It is OK to be fussy. I say it should be more than OK when you are paying someone to produce your wedding photos. It should be law. Your wedding photos must be just what you had in mind. After all, these wedding photos are for You to enjoy. It doesn’t matter what anyone else likes. They can have their say when they get married. The great advantage for a Byron Bay Photographer is that we have so many magic locations. Beaches, headlands, rivers, waterfalls, streams, mountains, rain forest, gardens and plantations. So many great streets around Ballina, Byron Bay, Ewingsdale, Bangalow, Lennox Head – the list goes on. No wonder there are more than 1000 weddings and elopements in Byron Bay every year! I spent years shooting landscapes and took on industrial photo jobs but wanted to photograph people. And what could be more satisfying than covering a wedding day. Weddings are fast paced. Taking on weddings meant I could create images that move people. There is the joy and the emotions but there would be no room for error. 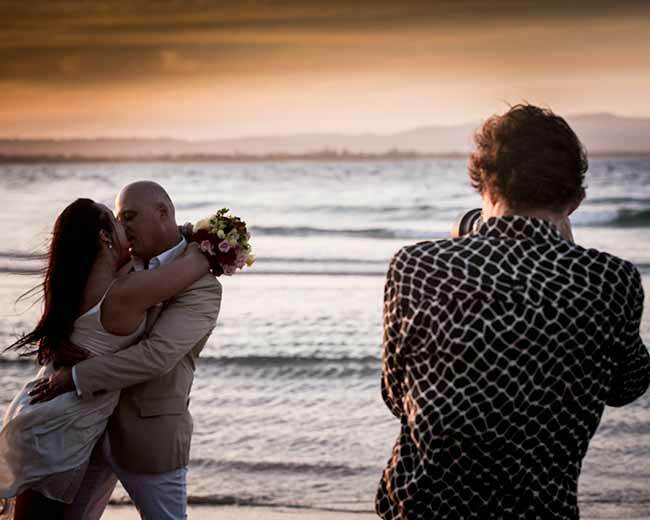 A Diploma of Professional Photography was the lever to start a Byron Bay Photographer business. I started cheap but didn’t care so long as I was getting amongst it. Now I look back now and realise that I have had so much pleasure from a truly enjoyable journey. Well the results were not worth showing off about. After Uni I got my hands on Dad’s Hanimex. He was not pleased but it lead me to buy my own TTL Pentax 35mm film camera. Photography became a serious hobby and there was a regular procession of lenses. Then I got into dark room developing and printing. I could fill my evenings with processing black and white and beautiful rich colour Kodachromes. Creative, but not very family friendly. As the family grew, so did my camera collection. My initial photographic sales were industrial. Not creative but a start. Great images not only tell the story of your special day. They show the emotions, the dynamics and those special moments in fine detail. Think about it. Your wedding shots enable you to relive your day for many, many years to come. Ask any happily married couple something about their wedding day and out comes the album . . . .
Here’s to a great wedding. Call me on 0439 866 337 to talk about your ideas.